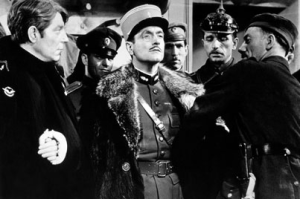 Jean Renoir's La Grande Illusion, one of the masterpieces of French cinema, returns to the screen this month to celebrate its 75th anniversary at three of London's Picturehouse cinemas. The film is about the relationships between different social classes in Europe, largely from the point of view of prisoners during the First World War. Aristocratic Captain de Boeldieu, mechanic Lieutenant Maréchal and wealthy Jewish banker Rosenthal are all in the same prison, despite their different backgrounds, and are plotting an escape. Boeldieu and Rosenthal become friends, reflecting their status in the cultural and social elite. This rapport confuses loyalties, and threatens Boeldieu's allegiances to the others, with tragic consequences. After the screening at The Gate, there will be a Q&A session hosted by David Jenkins of Little White Lies; Professor Ginette Vincendeau from King's College London; and Mike Newell, director of Harry Potter and The Goblet of Fire and Donnie Brasco. Screenings take place on 19 March 6pm, at the Gate (Notting Hill), Greenwich and Stratford East Picturehouses. Tickets cost £8.50 for adults, £7.50 for concessions.